In an area where you can, at the same time, enjoy the quietness of the countryside and the entertainment of the closest cities of Eretria just 5 minutes drive or Chalkida -15 minutes, and just an hour away from Athens in Malaconta in Evia, you will find these two comfortable houses. They share with two more houses a big swimming pool. 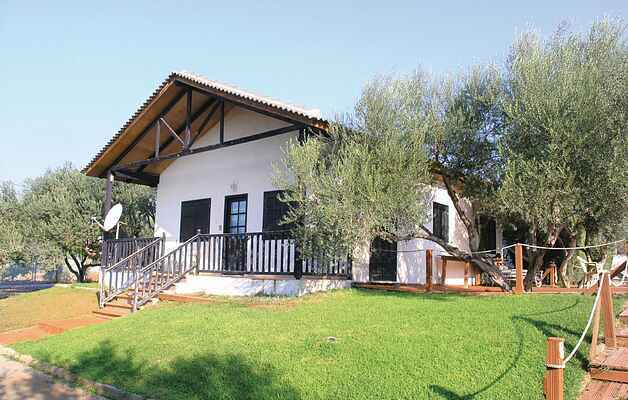 There, you will experience family atmosphere and lovely spaces in the middle of olive grove. The children will live their own dream, enjoy the pool and walk and play into a fully protected area of 30 acres. All houses are decorated with style and modern amenities in order to make you feel like home. Enjoy from your balcony, especially in the evening, the spectacular view of the Southern Gulf of Evia, in the relaxing silence of the countryside. Being in the center of Evia island, you can either travel North to visit the Monastery of John the Russian in the green Prokopi village, go to Evia lake village, to the waterfalls, the Stone Forest in Kerassia or South in the famous gorge of the river Dimosaris, the famous dragon’s houses in Karystos, Karavos, Aliveri, Nea Styra and many more places.